What is Guest list feature on member's home page and how is it useful? A new feature is introduced to the system that is very specific to Group. Many a times, a chapter allows the Members to bring guests to the event. However there is a no way a list of Guest can be managed and maintained into the system specific to each of the member. A Guest List feature has been introduced that allows a member to add and manage his Guest List. This mean, at any point in time, the Member would login to the system and use the Guest List option to add Guests. 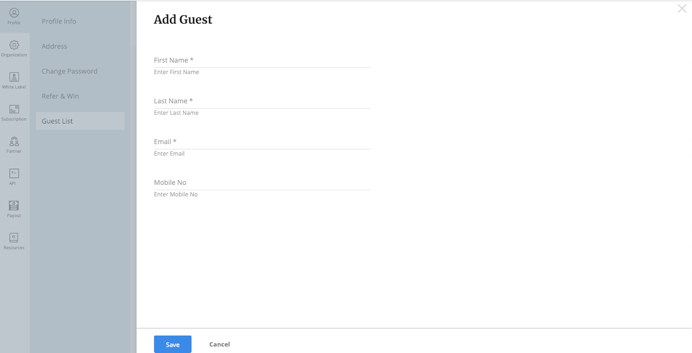 Once the Guest List menu is clicked, the Member is taken to its profile page where the list of all the guests added would be displayed and with a button to add more Guest. Having the option to add guest list to ones profile provides an opportunity to import Guest from the list at the time of registering for an event where the event organizer allows the Members to bring Guest. There is an specific setting that has to enabled by the Event Organiser. Once this setting is enabled, the Event will becomes an Authenticated Checkout based event where only Members could authenticate themselves and register for the event as well as would be able to add Guest from the Guest List.